I miss Bill Cosby's commercials for Jello Pudding Pops. I can't honestly tell you if they were any different than any other fudge-sicle, my taste buds weren't very discerning at ten, but Bill made me believe they were. But I can almost guarantee that these beauties from Bakers Royale are a thousand times better than anything that ever came in a cardboard box. And it probably has everything to do with the salted caramel. Salt makes all chocolate taste better. Cross my heart. 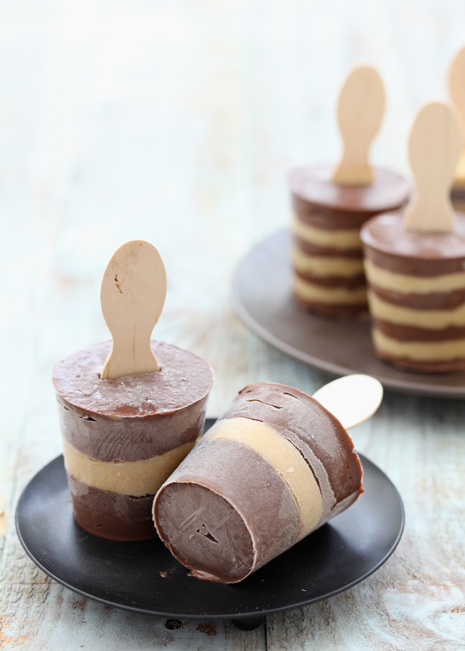 You can get the recipe for these pretty pretty pudding pops over at Endless Summer. And I am now counting down the days until summer so that I can make them with the kiddos! 43 more days! I think salted caramel should be it's own budget category at my house. yum yum yum!, I'm going to remember this for later. Oh, yum. I love salted caramel ideas! I completely agree with you: salt & chocolate are great together! these look so fun and amazing! i can STILL see bill cosby's face doing those commercials. love! OK if you keep posting stuff like this I am never going to loose weight before our trip to Kentucky! Bill Cosby said you and I should eat these in Kentucky.